FurCon (Further Confusion) is one of the world’s largest anthropomorphic (or “furry”) conventions, and is now in its fifteenth year. This year, two of the puppeteers from Mongrels will be appearing at the event! Warrick Brownlow-Pike (Marion) and Andy Heath (Nelson) worked together on the BBC3 show, and their appearance at the convention later this month seems to be causing a fair amount of excitement amongst the organisers. Andy began his career as swing performer on Doctor Dolittle – The Musical (1998). Since then , he has performed Kit on Play With Me Sesame UK (2004) and has also puppeteered guest spots on Jim Henson’s Mopatop’s Shop, as well as assisting on The Hoobs. 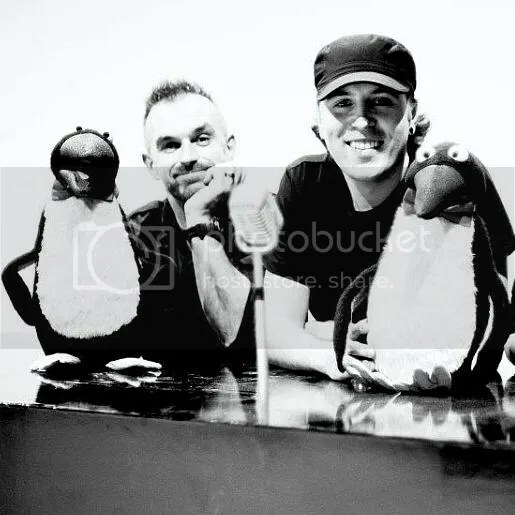 He performed a Penguin with The Muppets on their UK spot on The X Factor, and then puppeteered various characters on Muppets Most Wanted (2013). Later in the same year, he was also involved in The Robbie Williams Holiday Special on BBC1. His other ﬁlm credits include The Hitchhiker’s Guide to the Galaxy (2004) , Tales of the Riverbank (2008) , Harry Hill – The Movie (2013) and Frankenstein (2014). During 2009-2011, Andy co-designed, built and operated the puppets for BBC3′s adult sitcom Mongrels with his business partner, Iestyn Evans. Together, they run Talk to the Hand Puppets. Warrick has performed puppetry on some of Britain’s best loved and most watched children’s shows, most recently in Sesame Street’s The Furchester series. He was also a principal puppeteer in The Muppets last feature film Muppets Most Wanted. He has also been a writer, director and consultant for various projects, including the Jim Henson company. He worked with The Muppets in their most recent movie, and with Sesame Workshop. FurCon is being held in the San Jose Convention Center, San Jose Marriott, and San Jose Hilton. It takes place from January 15th – 19th, and the organisers promises eminent guests, educational panels, a dealer’s room with comics, artwork, collectibles and clothing, an art show, gaming, nightly dances and world-class costuming. Wowsers! For more information and to register for the event visit the convention website. Pre-registrations closes at 11.59pm on 10th January (local time), so make sure to get in there quick!